Although the use of pulmonary artery catheters (PACs, otherwise known as Swan-Ganz catheters) has never been shown to confer a mortality benefit, they are still routinely used in operating rooms and intensive care units to help guide resuscitation. Over my last several call shifts, I’ve used expired Edwards Swan-Ganz VIP+ thermodilution catheters to explain the basic structure of a pulmonary artery catheter (PAC) to the junior residents. Just like anything else, keep in mind that depending on the PAC, there might be variations in length, number of ports, etc. I’ll be discussing this particular Edwards VIP+ PAC since it fits the description of most conventional PACs in practice. The PAC is a quadruple lumen, heparin coated catheter that measures core temperature, cardiac output, central venous pressure, and pulmonary artery pressure. Additionally, one can obtain a left ventricular end diastolic pressure (LVEDP) and true mixed venous blood sample. PA port (distal tip, 0 cm) with a balloon. Used to transduce PA pressures. Syringe to fill 0.5 – 1.5 cc of air to inflate the balloon. There will be a locking mechanism to keep the balloon inflated or deflated. RV infusion (~20 cm from the tip). Once properly positioned, this port will reside in the right ventricle. RA infusion (~30 cm from the tip). This port will reside in the right atrium or cavoatrial junction. 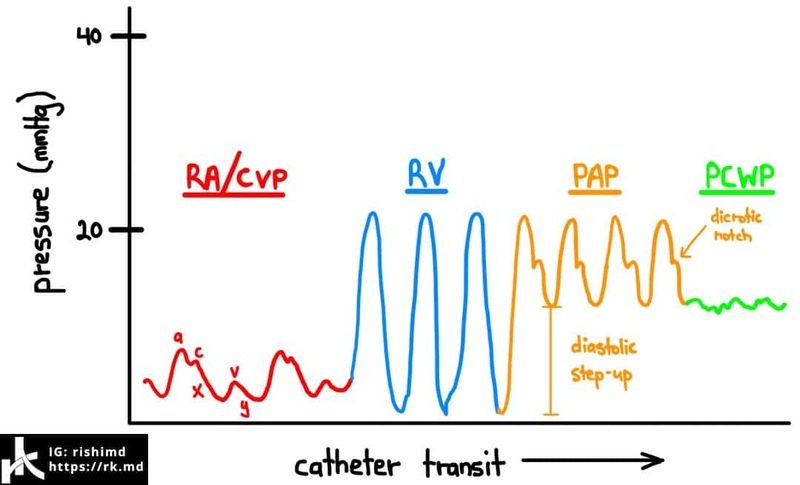 Useful to transduce central venous pressure (CVP). Proximal injectate/variable infusion port (~31 cm from the tip). Usually in the cavoatrial junction or superior vena cava and useful to infuse vasoactive agents. Cable connector to monitor cardiac output on a compatible device. Before floating the PA catheter, flush all the ports and verify that the balloon inflates symmetrically and collapses completely. Also ensure that the pressure transducers are zeroed appropriately. Placing the PAC requires a central vein introducer. Once the PAC is advanced past the lumen of the introducer (~10-15 cm), the balloon is inflated and “floats” to the pulmonary artery following the normal path of blood flow: right atrium → tricuspid valve → right ventricle → pulmonic valve → pulmonary artery. By transducing the waveform on the tip of the PAC, we can tell which chamber of the heart the catheter resides in. In cardiac cases where I’ll be using intraoperative transesophageal echocardiography (TEE), I usually put the TEE in first and use it to help guide my passage of the PAC in addition to the waveform. While advancing the catheter, one must be aware of any arrhythmias, however transient, as these can cause the patient to collapse. A patient with critical aortic stenosis, for example, relies on an atrial kick (during sinus rhythm) to augment their cardiac output. With an arrhythmia, the atrial kick is lost and cardiac output can fall precipitously leading to myocardial (and systemic) hypoperfusion, decreased contractility, even lower cardiac output… even worse hypoperfusion… yeah, downward spiral = BAD. For a right internal jugular entry, typically I advance the PAC 40-50 cm in an adult before entering the pulmonary artery. At this point, I’ll lock a sterile sheath over the PAC and onto the introducer. Always remember to deflate the balloon. If concerned about coiling within a chamber, also remember the deflate the balloon before withdrawing the catheter and trying to re-float it. 1. Is westzone 3 practical? Meaning how do you know when it’s there and will it float there all the time? Or is that just textbook information? 2. Also 1 out of 7 floats I’ll see it in the Left PA. How does that location change my interpretation (if it does at all)? 3. Sometimes I’ll see a waveform that looks wedged although the balloon is down and cxr looks fine (in the Pa) or waveform looks almost RV even tho it’s in Pa. Are numbers therefore not accurate, svo2 etc? Thanks in advance! Hey Darren, so there are several ways to have a rough idea if the catheter tip is in Zone 3 – PA wedge pressure is less than PA diastolic pressure, the catheter is below the left atrium on CXR, and the O2 saturation in the wedged position is greater than the unwedged position. Whether or not the PA catheter is in the left or right lung shouldn’t make a difference. As far as confirming positioning, I use bedside echo to confirm the catheter is at least passed the pulmonic valve. Sometimes it’s very easy to (accidentally) wedge the PA if the PA vessels are relatively small (think hypovolemia). I completely agree – I’ve mentioned on other social media outlets that intraoperative transesophageal echocardiography (TEE) basically eliminates the need for a PA catheter in the operating room. We place the PACs primarily for post-operative monitoring by the ICU teams.